Raccoons are strong, agile, adaptable, and they are very common in urban areas. They commonly break into garbage cans, dumpsters, steal pet food, or even enter homes via pet doors. They are great climbers, and they commonly enter attics of homes. They will rip open a hole and set up a denning area, and raise a litter of babies. They can cause a great deal of damage, and spread diseases with their feces, so removal is usually recommended. 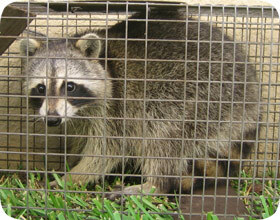 Read more about Raccoon Removal. Squirrels love to live in attics of houses! They find an opening near the roof or chew their way inside, and set up a nest. Twice a year, in late summer and late winter, squirrels have a litter of babies, and an attic is an ideal nesting site. You may hear them scampering and scratching in morning and evening. They can chew on wires in an attic, and cause a fire risk. Squirrels can also cause other problems, such as chewing on exterior house wood, or gnawing on plants. Read more about Squirrel Removal. 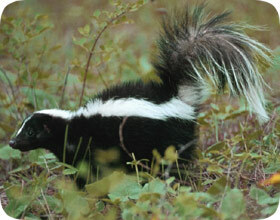 Skunks are of course well-known for their odor, which they spray from glands. They are common in urban areas, and they like to establish denning areas under sheds or decks of houses. They will sometimes dig to gain access to these areas. They will have a litter of young, and often spray during mating seasons or at other times, causing odor problems. They will steal pet food and threaten pets. They also like to dig up lawns in their search for food. Read more about Skunk Removal. 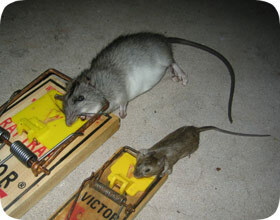 Rats and Mice thrive in urban areas, and very commonly live inside houses, in the attic, walls, and other areas. They often enter the house and scavenge for food. They can chew on electrical wires, they reproduce very quickly, and they can fill an attic with thousands of droppings, and spread diseases. You will likely hear them scurrying and scratching in the ceiling or walls at night. We remove them permanently by sealing their entry holes, without using poisons. Read more about Rat & Mouse Removal. Bats are great animals. They are also protected by law. They are very particular about where they will live, but often the attic of a house or other building provides an ideal warm, dry, high roosting location. 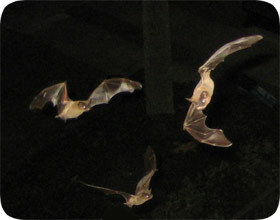 Bats live a long time, and a colony can often number in the thousands. Bats can leave behind a huge amount of droppings. Bat removal can be very challenging, in order to seal all the hard-to-reach access holes. We have a 100% success rate. Read more about Bat Removal. Some birds are considered nuisance species. Pigeons primarily live in cities, where they roost on buildings, signs, beams, and other areas. They will also enter buildings and attics, and set up nests. Other birds may intentionally or accidentally enter buildings, warehouses, supermarkets, etc. In all cases, the droppings are the matter of primary concern. We can install deterrents that will prevent the roosting, and we can remove single birds from large buildings. 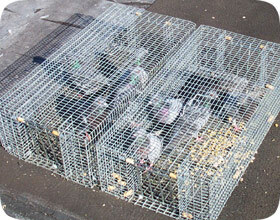 Read more about Bird Removal. Opossums are opportunistic, common, and great survivors. They will scavenge what they can, and often eat human garbage, pet food, etc. Possums are great climbers, and they will live in any shelter they can find, including the attics of homes, or underneath elevated houses, sheds, porches, etc. They may look threatening, but they are usually fairly docile. It is common to find the little ones in the summer, after they have dropped off of mama's back. 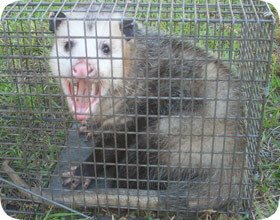 Read more about Opossum Removal. Groundhogs, also known as Woodchucks, are great diggers. They build an underground labyrinth of tunnels. They often dig next to or under human structures, which can undermine foundations. They will sometimes dig and live under porches, decks, sheds, etc. They are also herbivores, and are known for raiding gardens and eating crops. 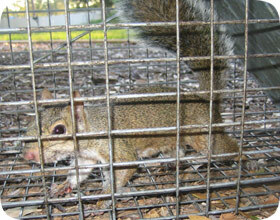 Some people use lethal traps, but they can be trapped in cage traps and relocated to mitigate the damage. 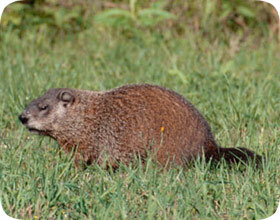 Read more about Groundhog Removal. Armadillos live in the southern United States, primarily in Florida and Texas, but also several other states. They are excellent diggers, and they will often dig a large burrow next to a house, displacing a lot of dirt. They usually dig several different burrows in a given area. They also dig up a lawn in their nightly search for worms and grubs. They are difficult to trap, but we have established techniques with a near-perfect success rate. 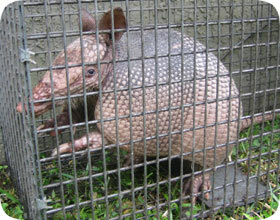 Read more about Armadillo Removal. Snakes are commonly misunderstood. While the USA is home to many species of venomous snakes, the truth is that the vast majority of snake sightings are of common and beneficial snakes, such as garter snakes, rat snakes, or harmless water snakes. In most cases, the best option is to simply leave the snake alone. However, we do provide snake removal services, can use snake traps, and perform some prevention techniques. 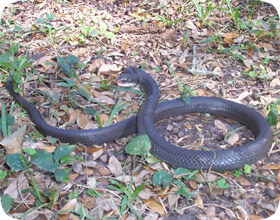 Read more about Snake Removal. If you've suddenly got a horrific odor inside your house, there's a good chance an animal has died somewhere inside the building! A rotting animal carcass, even from something as small as a mouse, can smell terrible. If you don't address the problem with animals in your house, one or more will eventually die, and then you've got to deal with the odor. 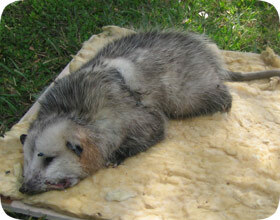 We find the dead animals, cutting the walls if necessary, remove them, and deodorize the area. Read more about Dead Animal Removal. 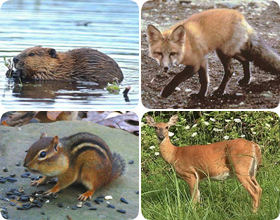 The above 12 are the most common nuisance animals that we deal with, but if you don't see your specific critter listed above, please click my other animals page, where I list many other species, including beavers, coyotes, fox, moles, vole (field mouse), flying squirrels, deer, rabbits, gophers, prairie dogs, otter, muskrats, nutria, feral hogs, porcupines, stray cats, & stray dogs..